For the past few season, Verizon’s exclusive NFL Mobile app allowed fans to watch certain live NFL games on their phones, provided they signed up for a premium subscription at a rate of $5/month. Starting in 2105, this service in now free to all subscribers. The available games will include all in-market Sunday afternoon games on Fox and CBS, Sunday Night Football on NBC, Monday Night Football on ESPN, and Thursday Night Football on CBS and NFL Network. When playoff time rolls around you’ll also be able to watch all playoff games and the Super Bowl. 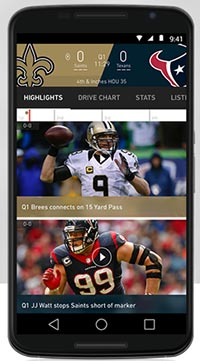 You need to be a Verizon Wireless subscriber to get access to the games, and of course, download the NFL Mobile app. The app is available for iOS, Android, and Windows. You’ll also want to keep in mind that data rates will apply.